Troops of Border Security Force ( BSF ), under Dhubri Sector apprehended one Indian trans-border smuggler near the International Boundary in the wee hours today. According to a official spokes person, during the early morning the BSF came across a group of cattle smugglers near BOP Patamari, located in the riverine area of Dhubri along with cattle heads. 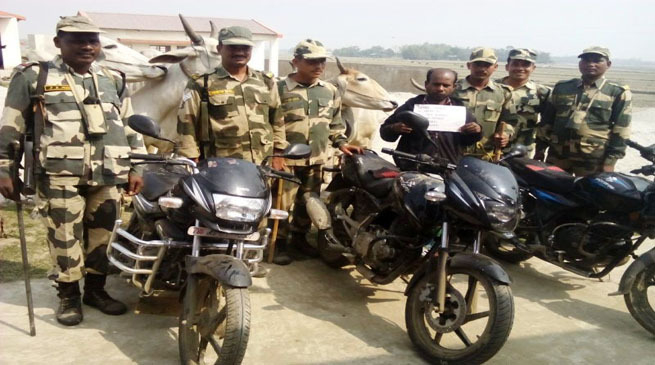 The BSF confronted the smugglers and managed to apprehend one smuggler namely Ainul Haque, along with 15 cattle heads and three motorbikes of which one was brand new Bajaj Pulsar without number plate. The total value of the seized items was Rs 350000/-.